(Eric Tucker – AP) American culture has become “less hospitable to people of faith,” Attorney General Jeff Sessions said Monday in vowing that the Justice Department would protect people’s religious freedom and convictions. Sessions spoke at a Justice Department summit on religious tolerance at a time when courts have been asked how to balance anti-discrimination laws against the First Amendment’s religious freedom guarantees. 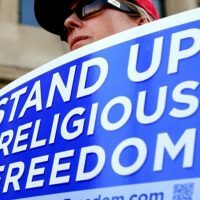 He also announced the creation of a “religious liberty task force” to implement Justice Department guidance on respecting and accommodating religious beliefs, including those of department employees.